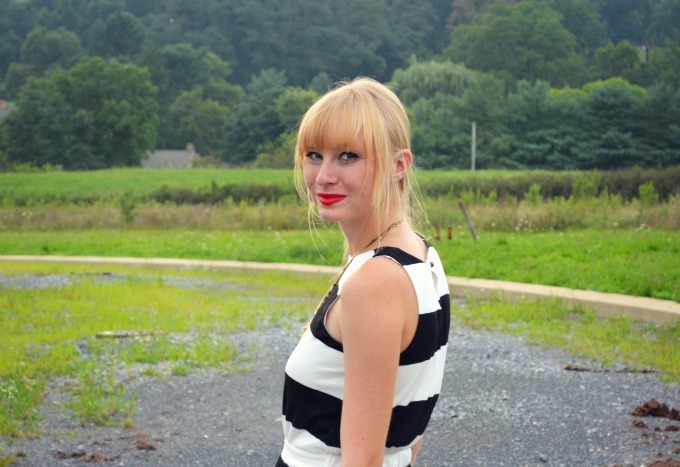 This dress was one of my favorite purchases this summer. Despite having 3 jobs over the summer, I had to be super careful about spending money and saving due to getting a new apartment so I tried to only pick out pieces I really loved whenever I went shopping. At first I was nervous about wearing this because every time I did, it attracted a lot of attention. I don't think it will once I'm back in Philly, but I try not to let that affect my choices when it comes to personal style when I am in my hometown. The older I get, the more I realize that others opinions over things such as personal style shouldn't really matter too much. Do you let the town/place you're at define what you wear? Or do you try and not take that into consideration? Wow such a gorgeous dress and the pop of red with the heels is amazing, takes the whole look to the next level!! 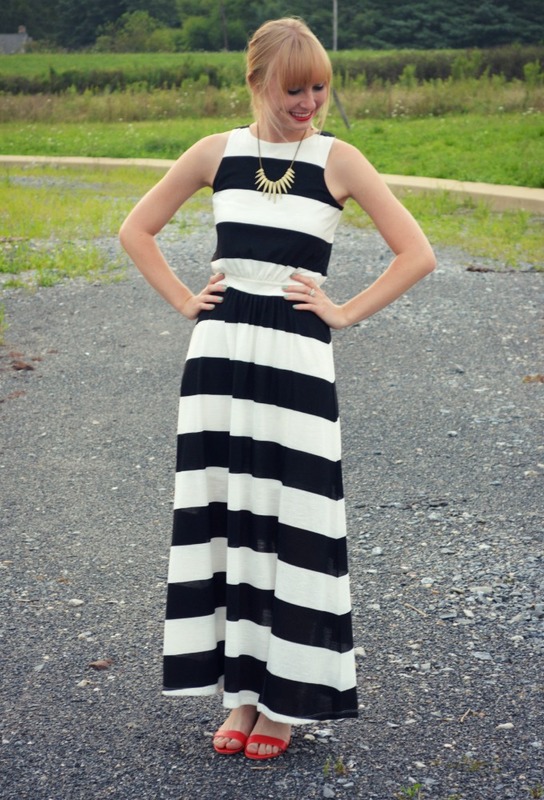 You look breathtaking in this maxi dress! I know what you mean about letting your environment affect what you wear - it's one of the things I really like about having moved across the country from my hometown - I feel like no one knows me here so I can be whatever I truly want to be without having anyone's expectations decide how I behave or dress. So pretty! I love the bits of red that you added. 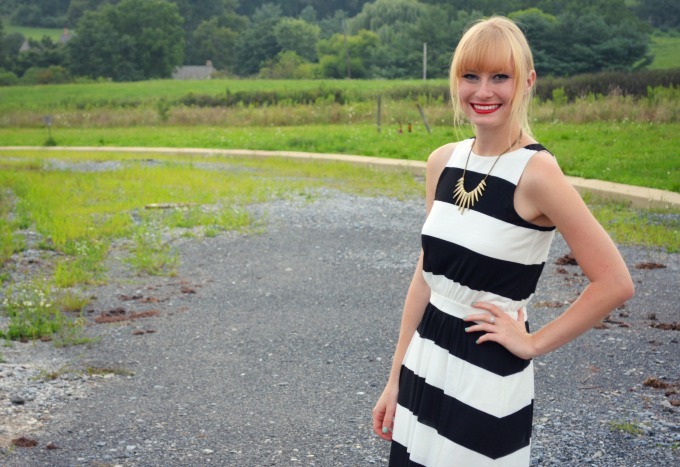 I love a good maxi dress, and this one is going to serve you well going into fall. I love pairing mine with a scarf and a leather jacket, or booties and a cardigan. Sometimes it can be hard to ignore what other people think, but going with your gut usually makes you feel the best. This dress is gorgeous! Also, the shoes! I almost bought them at Target, but I decided to hold out for when they went on clearance and then they were gone. Not like I need red sandals, but they sure are cute! I try not to worry too much about what others will think of the way I dress. I just never know what to say when people make comments that aren't quite compliments, like "wow, you must be very confident to wear such bright colors!" Um... thanks? It drew a lot of attention bc it's rockin'! Nice to meet you Chelsea, thanks for stopping by Patti Cake! Sooo, both our names are Chelse(y)-or (a), we both have black and white striped dresses, and we both LUVEEEE Tabasco! Kismet! I am in love with stripes! I love how bold and graphic it is, and yet how versitile I bet this dress can be. Sometimes I feel that where I am will dictate what I wear. Soe of that is common sense- weather changes and whether the outfit is work appropriate or not. But other times I too want to ignore the stares and just wear what I love, so good on you! Also, um, has anyone ever told you that you look a bit like Gwyneth Paltrow? Because you do!